The Google Display Network is making a HUGE comeback and Advertisers are migrating back to that platform. In fact, Google’s Display Network Revenue increased by 28% and CPC’s increase by 5% from last year. However, spending these ad dollars effectively requires a deeper understanding of data and putting together solid strategies that will continue to improve the ROAS%. Even with Google’s revenue increase, there are still flaws in the system that do not benefit the advertisers and it’s up to the PPC marketer to identify them and start taking advantage of all of the targeting options available. We target a younger audience of 18-35 who searching on behalf of their parents or grandparents, the messaging would need to reflect that intent. We target an older audience who are most likely searching for themselves, the messaging would need reflect that. Have you ever noticed Network Partner Sites that are NOT listed in the Adwords Placement Tool and you feel like your missing opportunities? Well, an easy way to maneuver around this is to simply create a separate campaign, where you create multiple adgroups with very distinct keyword themes and let them run for a week or two. After a few days, you will start seeing partner sites that were not originally listed when using the placement tool. Moreover, even if there might be any conversions from those sites, you will at least be able to identify sites that could very relevant to your audience . The idea of behavioral targeting and having visitors who visit an advertisers website and having display banners follow them throughout the Google network properties is a great way to increase Brand retention. However, the banners that are being served over and over should reflect a different message and/or offer to make them click. If a visitor clicked on an Display Ad and entered your website and did not convert, you would want to know why, right? This is similar to the tactic of Cart abandonment and sending promotional emails out to them with an offer to get them to convert. In this case, creating a separate campaign with a Specific Offer only to those who have already visited the site would be more effective, that seeing the same banner over and over. Yeah, it sounds strange, but you can actually learn a lot from Facebook Ads and take those learnings and apply them to your Google Display Campaign. Not to mention that running a Facebook Ads campaign is like throwing yourself into a Nascar Race Track — meaning that you can run a test and, within a hour or two, know which ads perform better before you continue spending the ad dollars. In addition, I would recommend Acquisio’s Facebook platform as they have built a phenomenal product that honestly makes it much easier to build out various testing strategies in a very short period of time. They are many ways to slice and dice the different targeting options within the Google Display Network. In most instances, the breakdown of targeting options is performed over time, not at the initial launch. The advertisers budget is Precious and the faster you can understand the “Who, What, Where and When”, the better you can put more of the ad dollars into what is working. It’s not so much a matter of “throwing tactics at the wall and seeing what works”. It all comes down to talking the time to look and understanding what the data is telling you. Once there is a story to be told, then act on the next steps. 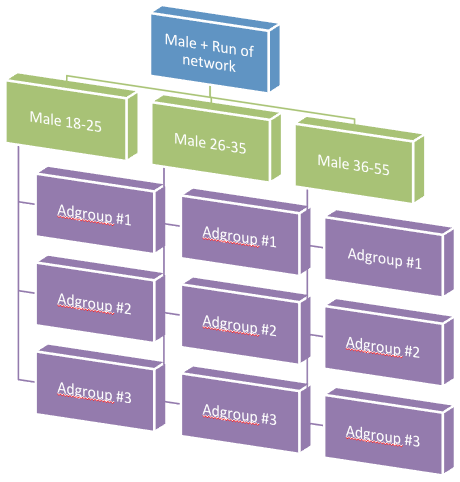 Tips on How to Spread your PPC Budget across Multiple Engines.